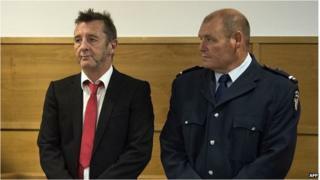 Phil Rudd, drummer of Australian rock band AC/DC, has changed his plea to guilty on a charge of a threat to kill, at a court in Tauranga, New Zealand. The court heard he was unhappy about his album's launch party and asked for a former employee to be "taken out". He had previously denied the charge. He also pleaded guilty to cannabis and methamphetamine possession. Prosecutors dropped a second threat to kill charge, relating to the former employee's daughter. Australian-born Mr Rudd was arrested at his home in the coastal town in November last year and has since been out on bail. The court heard on Tuesday that he had fired a number of employees in August after the launch of his solo album, Head Job. Media captionRudd's lawyer: "It was just an angry phone call"
Mr Rudd was concerned that security at the launch party at his restaurant Phil's Place was not tight enough, according to the court summary. A month later, the court heard, he telephoned an associate saying he wanted one of the people he had fired "taken out". He later offered the associate NZ$200,000 ($153,000; £100,000) as well as "a motorbike, one of his cars or a house", which the person assumed was payment "for carrying out his earlier request". Mr Rudd is then alleged to have called the victim threatening to "come over and kill you". "As a result of threats made by the defendant, the victim was genuinely very fearful for his safety", the court summary read. Mr Rudd's lawyer, Craig Tuck, told reporters outside the court that the charge "essentially revolved around an angry phone call - that was it". Mr Rudd, 60, faces up to seven years in jail for the threat charge. Possession of cannabis carries a sentence of three months and methamphetamine possession six months. He has been released on bail until another hearing in June. One of Australia's biggest music exports and among the highest grossing music acts of all time. Known for top hits such as Highway to Hell, You Shook Me All Night Long, Back in Black, Hell's Bells and Dirty Deeds Done Cheap. The band was founded by brothers Malcolm and Angus Young in 1973, who named it after the abbreviation for "alternating current direct current" - hence the lightning bolt on their logo. Angus, the lead guitarist, is known for his schoolboy outfits which he still wears for performances. The Young brothers were the only original members in the band for decades until Malcolm's departure in 2014 after he was diagnosed with dementia. More than a dozen people have been part of the band over the years, including late singer Bon Scott who died of alcohol poisoning in 1980. The band was inducted into the Rock and Roll Hall of Fame in 2003.